10.01.2005 - The below tips are meant for live-trapping raccoons. I have never used lethal traps for raccoons, nor have I ever killed a raccoon (other than a few cases of sick animals that needed to be humanely put down). So this page is not meant for fur trappers who use lethal traps or paw-hold traps. Tip #1 - Use a Large, Sturdy Trap The right type of trap is important. I've used several types and brands, and some have failed - raccoons have escaped due to design flaws. There's several good brands out there, such as those by Havahart and Tomahawk and others, but just know that you want a sturdy steel cage that is large enough, at least 10x12x32 or larger, and that has a sturdy latching door. Tip #2 - Use Good Bait Raccoons will eat a wide variety of baits, but they really seem to prefer the good stuff that people like. Sugar is great, such as marshmallows, because raccoons are attracted to eggs. Eggs will work as well, as will fried chicken, white bread, cat food, and almost anything. The primary danger with using meat-based baits is that you can catch stray cats or even friendly neighborhood cats. Tip #3 - Set the Trap Free From Obstructions Raccoons can reach up to 6 inches outside of the cage to grab on to things, and they will. They will also dig. If you set the trap next to wires, screened porches, ground lights, or anything, it WILL get torn to shreds or pulled into the cage and destroyed. Tip #4 - Set the Trap in the Shade Please don't set the trap in the sunlight where the animal risks being overheated and dehydrated. Tip #5 - Set the Trap Flush on the Ground If the cage rattles or wobbles upon entry, the animal will be shy. Make sure it's flush on the ground and doesn't move. Also, you can line the bottom of the trap with newspaper or leaves or anything to make it more inviting to walk on. Tip #6 - Check the Trap Frequently Please, check the trap every day, or multiple times a day, especially first thing in the morning. You don't want to leave a poor raccoon stuck in a trap for too long. Tip #7 - Don't Stick Your Fingers In When you pick up and move the trap, be very careful. If your finger goes between the bars, it'll get bitten. Hold the tray away from your body, because the raccoon can reach through the bars and scratch. Tip #8 - Hire a Pro This is easy for me to say, because it's my profession, but most amateurs do a lot of little things, and big things, wrong. I've seen a lot of trapping disasters. Plus, it's illegal in most states for you to trap and relocate raccoons yourself. Raccoon traps - The types of traps used to catch a raccoon depend on where the animal is located. 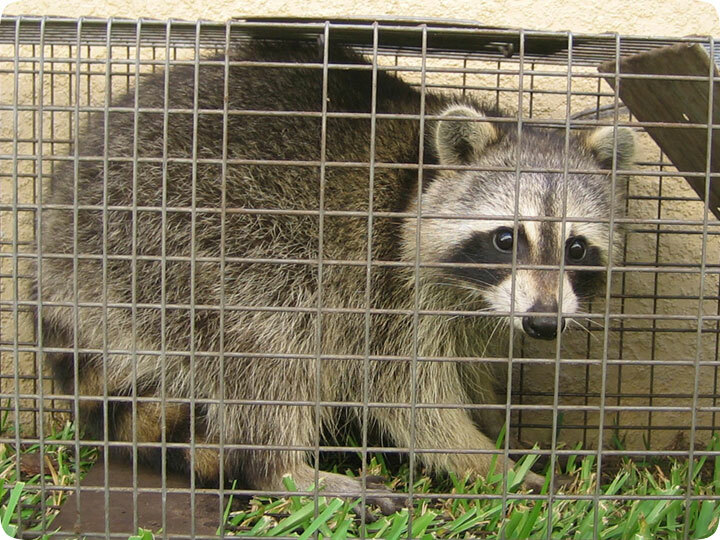 If the raccoon is inside of your home, you can purchase a cage trap to attempt to catch the animal, but you can't set it inside the house or attic and expect any success. It must be set outside, often on the roof, or mounted to the entry/exit hole. Be aware that most raccoons inside of buildings are there to have babies. If you do catch the adult, make sure you comb through your house and remove the kits once found. Cage traps work for a few different scenarios. You can use them for the rare instance when the raccoon doesn’t have young but is still inside the home. The cage trap can be secured to the roof near the entry hole or placed on the ground where the raccoon begins its climb upward. Only bait the trap with marshmallows or bread. Using meat or pet food might snag you a neighborhood cat. The other traps used for raccoon removal are also cage-like traps, but they are mounted on the entry holes to catch the raccoon as it leaves the building. This is particularly true for raccoons in the chimney. A special trap is attached to the top of the chimney flu. Some experts use the combination of the special chimney trap and encourage the raccoon out of the shaft with the use of a long pole.